Lost Album Gives Voice To A Johnny Cash In Recovery Fresh out of rehab, Cash recorded an album in the early 1980s that his fans never got to hear. 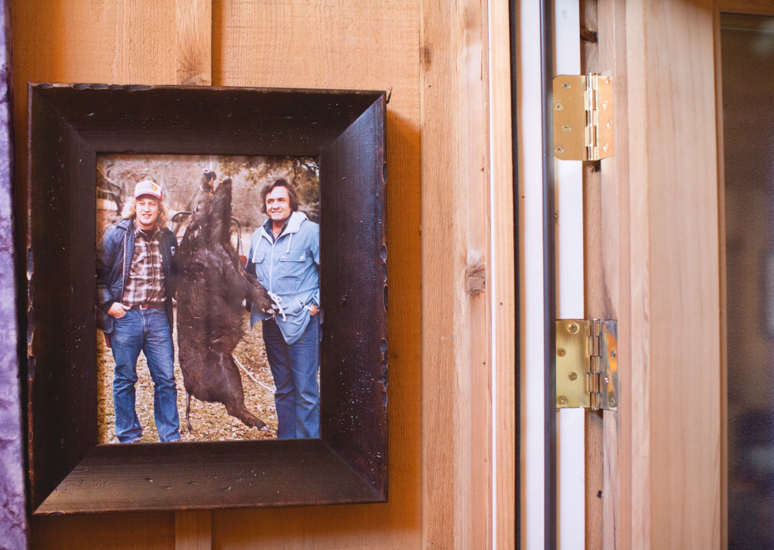 A vintage snapshot hangs in the cabin outside Nashville where Johnny Cash and June Carter spent much of their later years. On the porch of a log cabin outside Nashville lies the junk of country music royalty — an old bowling ball here, a Hotpoint stove from the 1940s there. Part retreat, part recording studio, this is where Johnny Cash spent some of his golden years. John Carter Cash, the only child of Johnny and June Carter, says his parents were major packrats. After they both died in 2003, the job fell to him to sift through the family vault across town. Among the things he discovered was a lost album, recorded in the early '80s by hotshot producer Billy Sherrill. "It's like finding an old Van Gogh in your closet," John says. "What do you do? A lost masterpiece makes for a pretty good story. But that's not how guitarist Marty Stuart recalls the recording sessions, which came at a low point in Johnny Cash's popularity: "Pretty good songs, pretty good performances — but no magic," Stuart says. The big names were starting to sing over orchestras instead of fiddles and six-strings. Cash's sound had evolved, but not that much. Shortly after making these forgotten recordings, he was famously dropped from Columbia Records. So John Carter Cash — a producer in his own right — invited Stuart and other musicians out to the cabin studio to give it another go. "When I listened to myself, I found there was profound room for improvement," Stuart says with a laugh. "That boy needed some work." For this album, titled Out Among The Stars, Stuart laid down new guitar solos. Dobro master Jerry Douglas came in to add some background twang. Carlene Carter — one of June's daughters from her previous marriage — even sang a third part on a duet called "Baby Ride Easy." While known for their duets, Johnny and June were also famous for their rocky relationship. Cash's career may have been foundering at this point, but John Carter says his parents were happy. 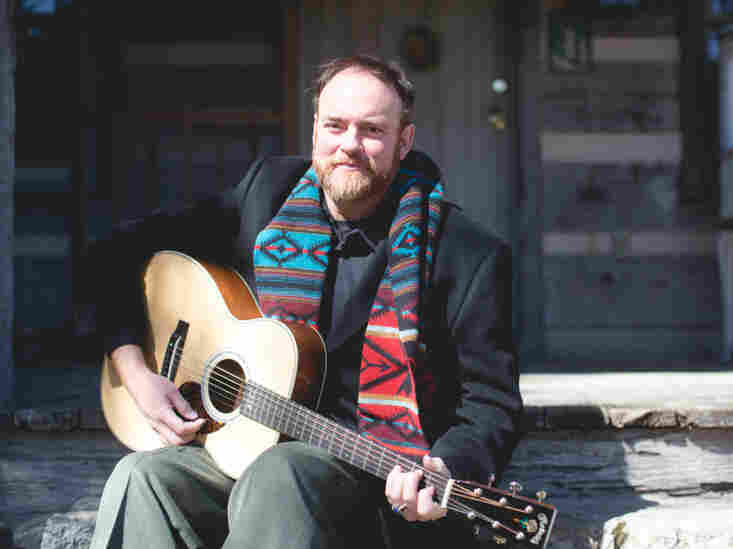 John Carter Cash relaxes on the cabin's front steps. "At this period of their life, they were focused and together. They were very much in love. Right before this, they were very close to splitting up," he says. When Johnny Cash recorded these songs, he'd just come out of rehab; he wrote the last track, "Came to Believe," while there. But even the songs on darker subjects have a lightheartedness about them. One, "I Drove Her Out of My Mind," describes a suicide by driving off Tennessee's Lookout Mountain. "Its comedic," John says. "He's laughing and making jokes about how the car dealer is going to feel after he commits suicide in the vehicle without paying for it." No one's expecting a chart-topper from this previously unreleased music. But John Carter Cash does hope to reshape a bit of his father's tortured legacy, away from the "Cocaine Blues" and toward the upbeat. "He was a man of a lot of laughter," he says. "Why not let the light endure? Yes, this cool image whatever brings people in, and it's part of who he was. I still haven't figured everything out about my dad, and I probably never will. And that darkness, that's truth. But that's not the full picture."